I was in fifth grade and had just moved from one side of Los Angeles to the other with my mom and sister following my parents’ divorce. It was November, so I arrived at Cleveland Elementary as the “new kid,” an identity I couldn’t shake the entire year. I’d noticed in my first week that slip-on Vans shoes were popular among the cool kids, and I was convinced that a new pair would help me fit in. My mom conceded and went to the shoe store, where I eyed the light blue/dark blue two-tones that everyone was wearing. 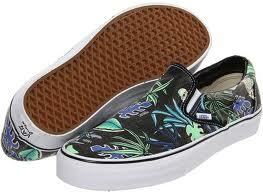 “Yes, those are popular, but there are also these; they’ve just come in,” the salesman said, pointing to a pair of Vans with a blue-green Hawaiian print. At first I said no; I just wanted what everyone else had. I knew that conformity was the quickest way to acceptance. I remember my stomach clenching in the face of the decision. I didn’t want to be the new kid: the one who was living in a new house with a newly single mother and a new latchkey that burned in his pocket. I wanted to be the kid who hadn’t moved, the one with old friends in the neighborhood and two parents at home. Or at least the kid with the same shoes as everyone else. And yet: the allure of the exotic, the different, the beautiful. They beckoned from the shelf, those Hawaiian-print shoes. “Let’s get them,” I said impulsively. The next morning, I was even more nervous than usual. The shoes looked so new I kicked them against my bedroom door a few times to create scuffs. I rode the bus feeling like my feet were covered in flashing lights. Would anyone notice? Would everyone? I got off and found my new crew of friends who appeared to reluctantly be accepting me into their crowd. I put those shoes away after school that day and never wore them again. Not once. I think of them every now and then and feel an ache above my ribcage: at how sad those unworn shoes looked in my closet; at the thought of my mom, how little spare money she had and how much the new pair of shoes must have cost her; at the kindness of my mother wanting me to have that particular pair because she could tell I liked them and she wanted me to have beautiful things; at the salesman, who was probably just trying to do his job (what did he know of fifth-grade fashion politics? ); and at my twelve-year-old self, who wanted so badly to fit in that he regretted for months that fateful moment when he’d strayed and listened to the louder voice that told him to choose the bold, relegating him even farther to the school’s margins. How long it took him to find solid ground. And yet I simultaneously feel relief that I am no longer that child, the one so prone to doubt and insecurity, a boat with a broken rudder with no way to navigate the channel. I inhale and exhale something sweet knowing that that need to fit in, and the loneliness of not, gave way to a stronger calling to honor my quest for the exquisite; that as I write this, I’m wearing a shirt that has bold green and blue designs on it that look abstractly Hawaiian. I’m grateful that I have learned to leave the port of safety and push forward even when convention yells at me to turn back.